Good news comes that the students of our school have made great achievements in NEPCS for middle school students. 23 students won the award in this competition. Dong Di won the first prize, Wang Zengyu and other 17 students won the second prize and Wang Qian and 5 other students won the third prize. 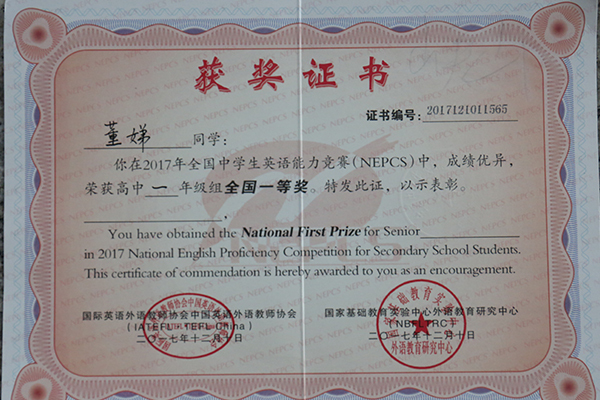 NEPCS is one of the most important English Contests in the basic foreign language Education. It is a comprehensive English proficiency competition for middle school students in China. Our school always attaches great importance to the core competence of English and all the teachers in our school study the standard and put it into practice, and the students love English so much. All has paid off. We will work harder for a higher goal.